In our family, I started cutting grass at the age of 9... barely tall enough to push the lawn mower (a Craftman 3 HP purchased the year I was born). Along with this was handling a rake for the "fall clean up". Now mind you, the trees in our yard were new, so for the first 4-5 years of my outdoor lawn care education, the quantity of leaves were small. As I moved into my later teen years, the trees grew significantly which of course meant piles of leaves - so we raked & bagged up the leaves... why? Well because that's what people did. Like any teen we wanted to be doing other things... playing neighborhood baseball/football, riding bikes, mini-bikes, etc. So I wasn't keen on spending an hour or so raking/bagging leaves a couple of times each Fall. Our house was on a standard suburban lot - 50ish feet wide by 100ish deep. So really it wasn't a lot of space... more than an apartment, less than rural lots. Being in a suburb - burning leaves was not allowed - so bagging for pick-up was the only option. This was before communities started doing community composting, etc. As the years went by I came to the conclusion that raking/bagging leaves seemed like useless effort when we had a mower that was doing an OK job of cutting grass... why couldn't it just cut the leaves at the same time? The old Craftsman mower eventually died and we got a brand new 3.5 HP push mower (e.g. no power drive). So - being the mechanically inclined youth that I was, I embarked on an experiment. Cutting up leaves with a mower. Now - let's be clear right up front! Cutting leaves, especially wet leaves is a tough job for an underpowered mower. Our little 20" 3.5 HP mower was definitely underpowered for this job - but I didn't let that stand in my way. Slowly but surely, I pushed the mower across the grass with the layers of leaves. It chugged through them and spit them out (this was before the era of mulching)... back and forth I went, occasionally clearing a clog w/restart; however, eventually the leaves were chopped up into small bits. I probably spent well more than the time it would take to rake them. Over time, I learned how to make that small mower do the chopping. What I was left with was small bits which were blown toward our bushes and trees - essentially this was 'mulch'. Was the grass clean as a whistle after I was done? Well no... and certainly by the standards that some folks set for their yards - not even in the same ballpark. 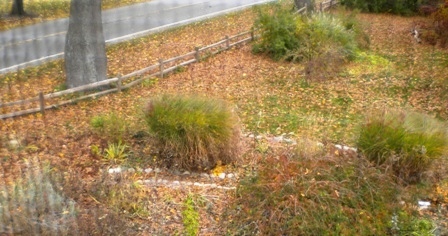 But funny thing is... about a week later - you couldn't even tell that I used the mower vs. raking the leaves. And my chopped leaves helped the grass, soil, and bushes - instead of ending up in the town dump (yep, that's what happened to all those leaves back then). So - fast forward to the future and my own home ownership rituals. The Marsh is quite a bit bigger than that suburban lot I grew up on. Lots of trees, some might call it a forest, including 200 year old Oaks, many, many very tall Maples, and being across and downwind of a tree & shrub nursery - Let's just say... we are the beneficiaries of significant quantities of wind-driven multi-colored Fall Gold. What some would consider "dirty" - we considered "Bounty". Yes - that's right... I've heard folks say that leaf drop is considered 'dirty'! Well folks, if that's the way you feel, buy land in the desert or strip your land and cover it with astro-turf (don't forget to wall it in, so you don't get wind blow 'dirt') - - - sheesh! As Fall arrives - so does the proverbial loud blower noises, smell of burning leaves, and the raking/bagging starts all over again. Leaves should not be 'bagged', leaves should be chopped/mulched and used "ON YOUR Property". That's right - in your planting beds, mulch right into the grass... is the best option. Blowing leaves around - which also moves a portion of the top layer of your lawn soil with it - sure seems like such a waste. These same folks then go back and fertilize, add a new layer of top soil, etc. Leaves are nutrition..., they are free and dropped right there for you - you don't have to drive to the box store to get it, or have it delivered. Why are you getting rid of it? Cutting/mulching leaves is a lot like blowing snow. There can be small amounts or large amounts - but essentially you eat the elephant one-bite-at-a-time. If the leaves are dry and a consistent layer of 1-3 inches - just mow over. If piles - then you have to take smaller slices through the pile - else you will be unclogging/restarting more. At no time do you stick your hand near the running mower blade! Common sense! Make all mower adjustments when the engine is off! Don't do this on wet leaves - as they will clog more easily and worse, wet leaves are a slip hazard and your toes need to stay attached to your feet! Safety First!!!! Step 0: sharpen your mower blade. I file mine each week of leaf mulching. A sharp blade makes your mower work less. Step 1: set your mower to it's highest setting - 3, or 4" if possible. Step 2: if you have piles of leaves, try to make them long rows... walk through the piles, shuffling your feet. This also helps you know that there isn't anything 'in the pile' that could be dangerous with a spinning mower blade. If necessary, use a rake to spread them out, but don't get to the point of 'raking'. Step 3: mow. mow. mow. mow. Take off bites, let the mower do the work a bit at a time. If you have to go into the middle of a pile - you will have to go slowly, possibly tipping up the front wheels so that you don't stall the mower. Easiest to slice off about 1/2 the mower width when dealing with a pile. If the leaves are just a layer - just mow like you cut grass. Step 4: lower the mower height to 2 inches or so - then criss-cross what you just did. Step 5: wait a week. More leaves will drop. Do this again. You may/may not have to use the highest setting - after the first leaf drop. Step 6: depending on how much your gifted - you may have to do a third cutting. Here at the Marsh - we do 2 or 3 cuts depending on when the first sticking/staying snow hits. The first as part of normal grass cutting. The second after the first heavy drop and windstorm, and the 3rd as a final clean up when the last trees give up their bounty. OK - but what does it look like? The following pictures were taken over about 4 hours on the same afternoon. Before, during, and after cutting one area. The before picture, above - is an area of about 110 by 75ft. The leaves accumulate from the 2 old Oaks and also wind blown from the nursery. The middle fence line has about 6-10" of leaves piled up, the bottom 2" is moist. Extending out from the fence line - the leaves get very thin. The part near the fence is slow going, the parts away from the fence move about as fast as just cutting grass. The 'high-cut' picture, above - is the first cut. The volume of leaves are knocked down significantly. Time now to lower the deck height. Not to scalping level - but probably one notch lower than normal grass cutting height. The 'low-cut' picture, above - is second cut at the lower setting - for me, no more than 2 inches. This results in very small chunks in the thick area of leaves along the fence line. This area is planted with hostas and daylilys so they will directly benefit from the heavy mulch layer. The main grass areas have been significantly cleaned up as most leaves are now in small bits - 1/4" to 1/2". This will soon disappear as weather, worms, and microbes do their work. For the first several years here, I used an 18HP riding mower, this mower was not a mulcher, so it would just cut/blow out the chute and then I would use a sweeper attachment to collect the results and dump into our compost area. For the last 7-8 years, I've used a 6.75 HP Toro 22" mulching mower to cut a total of about 1 to 2 acres of grass areas. This is where the leaves end up during the Fall. This mower works just fine - as long as the leaves are not wet, and if in piles 3-6". Any higher and I move the pile around (as noted in above steps). Mowing this much grass - by walking - is great exercise and cheaper than a fancy health spa. Additionally, the old riding mower would eat up about 3 gallons of gas for 2 hours of cutting time. The walking mower uses a bit more than 1 gallon and it only takes me 3 hours for a full cut. So 1 hour of extra time, mower costs 1/3 as much, gas costs about 1/3 as much - plus needed exercise --- Winning! Mulch your leaves. Use the results in your garden beds. Use less amendments. Stop burning leaves. Stop blowing leaves. Save your hands from the rake blisters. Reap the benefits of what nature is giving you.